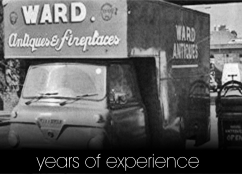 Wards Antique Fireplaces uses a team of fitters that have been with us for many years. They are very experienced. We use Gas Safe registered gas installers, we also offer a solid fuel fitting service. If you would like a quote for fitting please feel free to contact us. All quotes maybe subject to a further charge if the destination is further than an hour from our head office (BR3 4EP) please call for quotes 020 8650 9005. The fitting price allows for up to 6 inches of plastering around the fireplace, excess plastering may result in a further charge. All rubbish is bagged for you and placed in a designated spot but will not be taken away. Whilst we have every faith in our fitters it is important to point out that they are self employed, and as such should any disputes arise we will help out in any way we can but ultimately the dispute will be between yourselves and the supplied fitter.